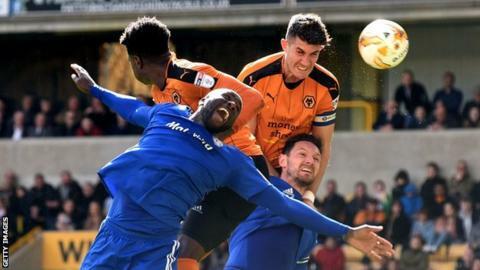 Danny Batth scored twice as Wolves beat Cardiff City to move eight points clear of the Championship relegation zone. Wolves captain Batth opened the scoring with a header for his second goal of the season. Kenneth Zohore's ninth goal in nine games brought Cardiff level soon after but a second header from Batth restored Wolves' lead before half time. Helder Costa's fine individual goal sealed a fourth successive win for Wolves with seven minutes remaining. Defensive mistakes and missed opportunities proved costly for Cardiff, who have not won away from home since victory at Derby in February. The Bluebirds slipped one place to 14th in the table while Wolves, who edged closer to safety, remain 16th. Batth's header put Wolves in front after Andreas Weimann headed Ben Marshall's free-kick across the penalty area with Cardiff punished for defensive mistakes. Neil Warnock's side were level within three minutes when Denmark Under-21 striker Zohore netted his 11th goal of the season, beating Andy Lonergan to the ball to head home into an empty net. Cardiff had further chances when Aron Gunnarsson pushed his shot wide after being set up by Zohore, who along with Junior Hoilett failed to react to a Sean Morrison head down. But Batth restored the home side's lead with his second goal of the game four minutes before the interval. Marshall's brilliant cross from the right-hand side found the Wolves captain at the far post, and Batth rose above Morrison to head home. Batth nearly scored a hat-trick from a Marshall corner, only to see his header fly over the bar. Cardiff substitute Craig Noone struck the post before Costa sealed Wolves' victory with a tough of magic. The Portuguese winger was released by Edwards with a weaving run through the Cardiff defence before nonchalantly rolling the ball past Allan McGregor. Wolves manager Paul Lambert told BBC WM: "I thought it was well deserved. We were excellent right from the off - some of the football we played was fantastic. "There's a lot of work still to be done but we're on the right road of trying to create something really good here. "In comparison to some other clubs we're nowhere near where we want to be in the division, but we're exciting to watch." Cardiff City manager Neil Warnock told BBC Radio Wales: "I don't think they won the game, I think we lost it We looked comfortable early doors and even when they scored we looked dangerous. "I don't think there was much wrong. You couldn't say they didn't try - we didn't get the rub of the green on certain decisions but you're away from home and don't expect that." Second Half ends, Wolverhampton Wanderers 3, Cardiff City 1. Attempt missed. Bruno Ecuele Manga (Cardiff City) header from the centre of the box misses to the right. Assisted by Craig Noone with a cross following a corner. Attempt blocked. Joe Bennett (Cardiff City) left footed shot from the left side of the box is blocked. Assisted by Kenneth Zohore. Substitution, Wolverhampton Wanderers. George Saville replaces Andreas Weimann. Attempt saved. Craig Noone (Cardiff City) left footed shot from the right side of the box is saved in the bottom right corner. Goal! Wolverhampton Wanderers 3, Cardiff City 1. Hélder Costa (Wolverhampton Wanderers) right footed shot from the centre of the box to the bottom right corner. Assisted by David Edwards. David Edwards (Wolverhampton Wanderers) wins a free kick on the left wing. Substitution, Cardiff City. Anthony Pilkington replaces Kadeem Harris. Substitution, Wolverhampton Wanderers. Jón Dadi Bödvarsson replaces Ivan Cavaleiro. Substitution, Wolverhampton Wanderers. Romain Saiss replaces Ben Marshall. Offside, Cardiff City. Peter Whittingham tries a through ball, but Jazz Richards is caught offside. Ben Marshall (Wolverhampton Wanderers) is shown the yellow card for a bad foul. Foul by Ben Marshall (Wolverhampton Wanderers). Craig Noone (Cardiff City) hits the right post with a left footed shot from outside the box. Assisted by Aron Gunnarsson. Attempt missed. Danny Batth (Wolverhampton Wanderers) header from very close range is high and wide to the right. Assisted by Ben Marshall with a cross following a corner. Attempt blocked. Ivan Cavaleiro (Wolverhampton Wanderers) right footed shot from outside the box is blocked. Assisted by Hélder Costa. Substitution, Cardiff City. Craig Noone replaces Junior Hoilett. Substitution, Cardiff City. Peter Whittingham replaces Joe Ralls. Attempt missed. Sean Morrison (Cardiff City) header from very close range is too high. Assisted by Aron Gunnarsson.